Welcome to the Mid Hants Balloon Club. 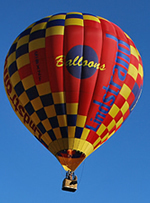 The club was formed in 1990 with the aim of uniting the ever increasing number of balloonists in Hampshire and the surrounding area. The geography of the club covers Hampshire, Southern Berkshire and West Surrey, maps 174, 175, 185, 186, 196 and 197 but draws its members from Kent in the east to Wiltshire in the west. 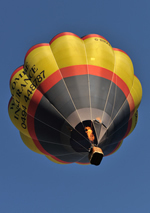 It has an active membership of over 60 and if you are interested in any aspect of hot air ballooning you are welcome to join. 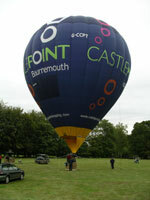 The governing body of the sport of Ballooning in the UK is the British Balloon & Airship Club (BBAC) to which The Mid Hants Balloon Club became affiliated in 1991. If you ever wanted to be part of a balloon crew, learn to fly a balloon or just wanted to be around balloons we can put you in touch with the right people to help you start out in this most rewarding sport. The club puts on a varied programme of events throughout the year. Monthly meetings are held on the second Friday of each month, check the news page for the dates and locations of these meetings.During the summer months we organize club flyouts when conditions permit. Our services page lists our committee members and members of the club who are qualified BBAC Instructors. As agreed by the commitee all contact details are now password protected on the forum. A Great Night Out in aid of Charity at the Blackbush Flight Simulator - Thanks! A terrific flyout from West Wittering - for Pictures click here. Read about an exciting flight to the Isle of Wight along with superb photos click here.